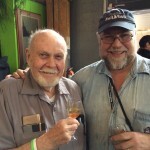 The week in craft beer for June 16 – 19 includes PDX Beer Week, Cider Summit PDX, Eastern Oregon Beer Fest and Oregon Garden BrewFest that all happen this weekend. 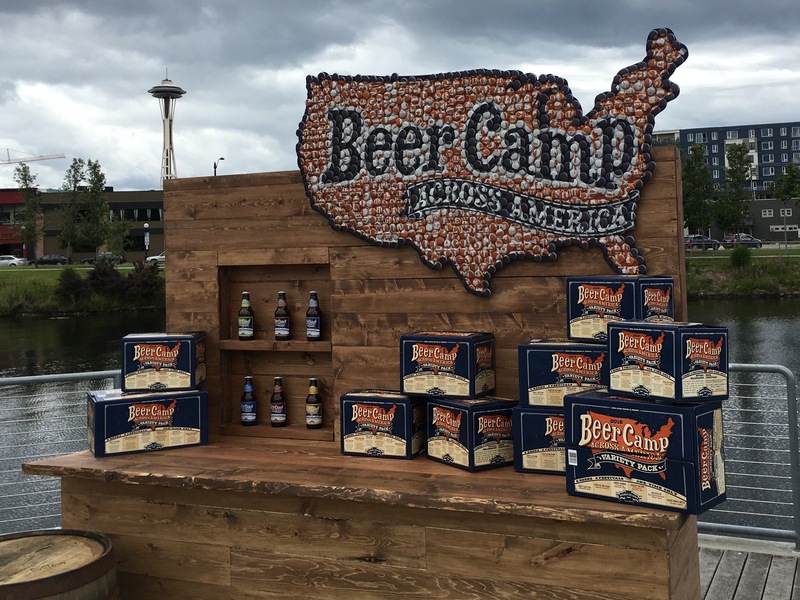 All the Beer Camp across America beers will be pouring at Belmont Station: Sweet Sunny South Southern Table Beer, Moxee-Moron Imperial Session IPA, Family Values Imperial Brown Ale with Cocoa, West Latitude Session Rye with Hibiscus, Pat-Rye-Ot Revolutionary Ale, and Stout of the Union Robust Stout. The rivalry between Oz and New Zealand runs deep but both countries produce great hops that are becoming more popular in American craft beers thanks to their distinctive flavor and aroma. Try beers produced with hops from each country, buy a banger at the sausage sizzle, enter the raffle and try your hand at beer trivia moderated by John Lovegrove. This Father’s Day weekend enjoy 60 breweries, pouring 120 beers, ciders, and meads from all over the state and across the country. Now located in the Rediscovery Forest, you can sip your brew as you wander through 80 acres of verdant greenery, listen to great regional musicians, and taste good food from local vendors. Minors are welcome Saturday until 5pm and all day Sunday – Father’s Day – when there will be fun family activities. Join the women of craft beer for an evening of pints and philanthropy. Every beer on tap comes from a brewery where a woman is involved in brewing the beer and Civic Taproom & Bottle Shop will donate part of the proceeds from the the event to the Pink Boots Society, an international women brewers’ group founded by Teri Fahrendorf. Breweries include Burnside, Culmination, Drinking Horse, Fort George, Gateway, Heater Allen, Leikam, Mazama, Pfriem, Stone and Worthy Brewing. Here’s your chance to meet some brewery owners over a beer. Mingle with the likes of Rob Widmer, Matt Swihart of Double Mountain, Mike Wright of The Commons Brewery and John Harris from Ecliptic. Presented by World Foods Portland and Bushwhacker Cider, Cider Summit PDX celebrates local, regional and international artisanal ciders and cidermakers including dozens from the Pacific Northwest and ciders from at least five states and five countries. Cidermakers and importers will be on hand to inform and guide guests through the tastings and several will be participating in the second annual Oregon Fruit Products Fruit Cider Challenge where they will create pilot batch fruit ciders using Oregon Fruit Product’s puree and the attendees will vote on their favorites. Also: specially paired food selections available for purchase from World Foods, Streetcar Bistro and other small bites; live music on the Jim Miller Festival Stage includes a stellar blues line-up produced in association with event beneficiary, the Cascade Blues Association; and here will be a Dog Lounge hosted by DoveLewis and PetCo which will provide dogs and owners an opportunity to refresh and socialize. The Mongers open the cellar and pour rare beers Almanac, Alvinne, Baladin, Firestone Walker, Glazen Toren, Heretic, Hair of the Dog, Russian River and more. Celebrate the release of this collaboration IPA with Ecliptic Brewmaster John Harris and Worthy Brewmaster Dustin Kellner. 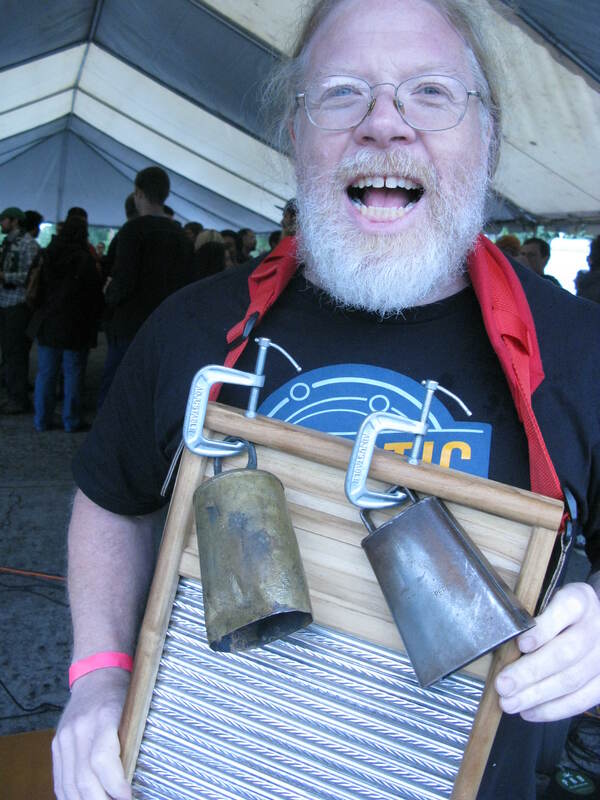 Saturday June 18, McMenamins Barley Mill Pub, 1628 S.E. Hawthorne Blvd. ; free admission. Join the McMenamins in their annual celebration of their faithful pub, which was the first joint venture of the McMenamin brothers. The party includes food specials, live music at 3 p.m., a birthday brew, birthday cake and a special 33rd Birthday Passport Stamp. The anniversary beer has 72 additions – all tasted and vetted a month ago by a panel of McM’s brewers and managers – which range from a 2009 Black Rabbit Red wine to Grappa to craft this one-of-kind brew. Celebrate Portland’s favorite beer with some of the acknowledged masters of the style from Ballast Point Brewing, Alpine Brewing, Melvin Brewing, Hopworks Urban Brewery, Boneyard Beer, Hop Valley Brewing, Fremont Brewing, and Ecliptic Brewing. 2 p.m. Saturday June 18, F.H. Steinbart Co.; 234 S.E. 12th Ave.; free. Taste a dozen Oregon IPAs and help the Oregon Beer Growler staff choose the best of the lot to be featured in next month’s edition of the magazine. Sour beer fans can celebrate the Solstice and their favorite style at the same time, and select from an impressive list of sour beers to sample. Noon- 4 p.m. Sunday June 19, The Evergreen, 618 SE Alder St.; $49 includes all 10 small plates, collectible glass and 10 beer pours. 10 a.m.-5 p.m. Sunday June 19, Unicorn Brewing, 6237 S.E. Milwaukie Ave,; $10 includes samples of all six beers. Brewer Jay Webb and crew used one base malt recipe to highlight the individual hop varieties, including Bravo, Cascade, Galaxy, Nelson, Centennial, and Mosaic. Hop profiles are accented by 2 Row Crystal 15 Malt from the Country Malt Group and American Ale Yeast. 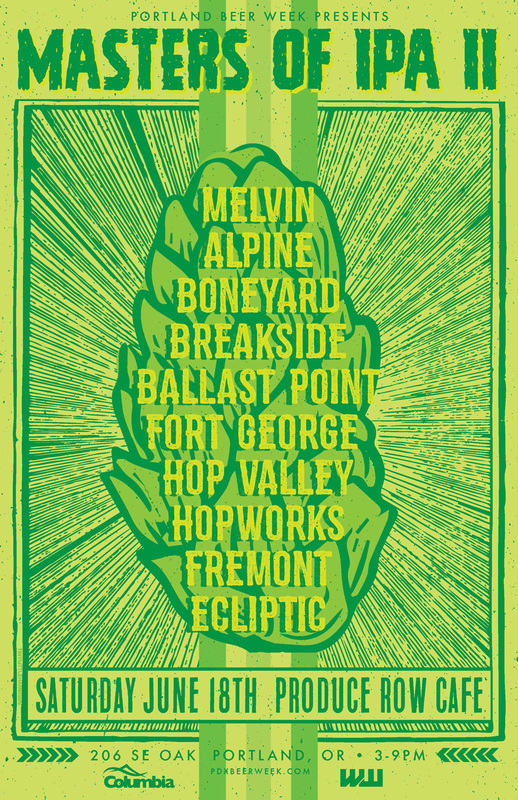 Celebrate the last day of Portland Beer Week and learn about hops at the Portland U-Brew Pub. 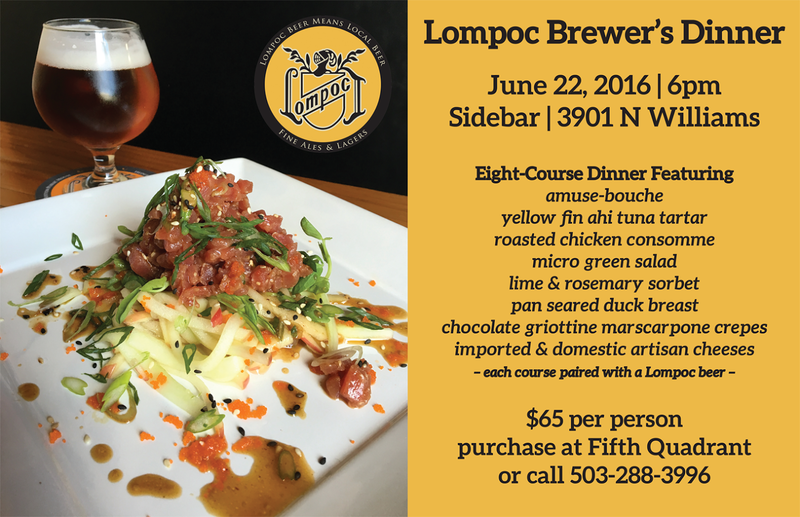 6 p.m. Wednesday June 22, Sidebar barrel tasting room, 3901 N Williams Ave.; $65 per person, 503-288-3996. Lompoc Brewing Chef Mark Otey and Head Brewer Bryan Keilty present an eight-course Brewer’s Dinner which includes: Yellowfin ahi tuna tartar paired with Cranberry Saison; Roasted chicken consommé, paired with Spring Bock; micro green salad tossed in a vinaigrette paired with Mystical Apricorn Belgian Pale Ale; lime & rosemary sorbet, paired with Straight Outta Hopton IPA; Pan seared duck breast with brandy cherry glace de canard paired with 2012 Black Mamba Sour Stout; and ending with imported & domestic artisan cheeses with grapes and crostini, paired with select Lompoc beers. No one will leave hungry!